You know very quickly when you are driving something special, and the 500 Abarth is special. We drove the 2014 Fiat 500 Abarth for a week and had about as much fun as any car we tested in recent months. There is no doubt that the Fiat 500 Abarth brought world-class performance and precision, purposeful and aggressive styling, high power-to-weight ratio and limited-production volume to the small-car segment in North America. The Abarth badging on the 2014 Fiat 500 Abarth has a tint of dare we say a Ferrari in just the slightest but most impressive way. The aggressive styling of the Fiat 500 Abarth embodies the Abarth brand tradition in full — purposeful and intentional details, all designed to improve the car’s performance, while enhancing the clean and simple design language of the Cinquecento. Our test model proudly boasted rosso (red) paint and sweet 17-inch x 7-inch forged aluminum hyper black wheels, which set the tone for this confident compact. To improve aerodynamics and the necessary engine compartment space for the 1.4-liter MultiAir Turbo engine, the Fiat 500 Abarth and Abarth Cabrio feature a more pronounced front fascia. For additional air intake, the signature “Abarth” shield floats on a finned surface and a larger intake below consists of three inlets with broader openings than the standard Cinquecento models. For a more aggressive look, twin “nostrils” are precisely positioned on the front fascia to maximize airflow in and out of the two engine intercoolers (both intercoolers are visible through the “nostril” inlets). Abarth-designed side skirts give an athletic profile, while 16-inch or optional 17-inch (as tested) lightweight forged-aluminum wheels fill the flared wheel arches and provide ventilation for the performance brake system. From the rear, an aggressively-styled, Abarth-specific, cloth top-mounted spoiler extends the roofline and improves the Abarth Cabrio’s aerodynamic behavior by creating additional downforce. Below, the two-piece Abarth-styled rear fascia accentuates the road-holding stance and optimizes airflow with its rear diffuser. Integrated behind the diffuser, the low-restriction Abarth-tuned exhaust system features concentric “double tips” and the signature Abarth-tuned sound. Quality, style and fun all come together to invigorate you in the cabin of the 2014 Fiat 500 Abarth. The interior design theme of the Fiat 500 Abarth and Abarth Cabrio is an artistic blend of clean lines and functional performance appointments. An Abarth-designed steering wheel features a thick rim, perforated leather and flat bottom to provide the look, feel and increased roominess desired during at-the-limit driving. A large concentric instrument cluster with 160-mph speedometer, tachometer and trip computer sits behind the steering wheel and features a leather-wrapped cluster brow wrapped in Nero leather with Rosso accent stitching. To the left, an analog turbo-boost gauge has an integrated LED shift light in the center that illuminates an instant before redline to optimize gear changes. Below the instrument panel, Abarth-designed aluminum pedal covers feature Nero rubber trim for a decidedly racing look, while the Nero leather shift knob with Rosso accent stitching provides a precise feel of the shifter. 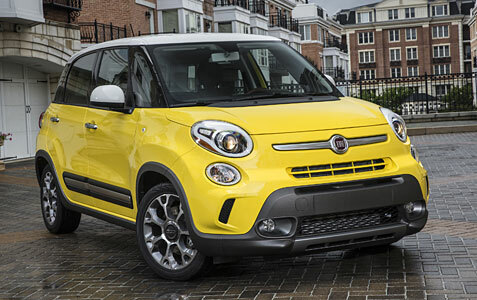 Fiat has been steadily gaining back a foothold in the North American marketplace and now looks to continue that growth with the 2014 Fiat 500L Lounge. The all-new 2014 Fiat 500L expands the Cinquecento’s appeal by offering 42 percent extra interior space with comfortable seating for five. We drove a 500L Lounge for a one week test and came away with the following impressions. According to Fiat, the 500L was designed with the active and thrill-seeking North American customer in mind, as the 2014 Fiat 500L Trekking expands the appeal and practicality of the Fiat 500L with distinct and rugged looks. We found the 17-inch painted aluminum wheels, white roof and bi-function halogen projector headlamps to be very stylish, but the overall design was not as sharp as competitors in our opinion. There is no question that the 2014 Fiat 500L Lounge has its own look, but that look can come off as somewhat quirky. A design that could build off the cool front fascia might be the way to go here! When you enter the cabin of the 500L Lounge, there is no doubt that quality materials played a big role in the finished product. Fiat went for a “loft-like interior,” which will work for some car buyers, but there is also a feeling that you’re in a miniature school bus. With that feel comes way more room that the two-door 500, but without the sporty appeal that we loved about the 500. The power sunroof was large and the Beats premium audio system with six speakers was awesome. One thing that needs to be addressed is too much engine noise making it’s way into the 500L. Cars are usually a thing of beauty. They have the sleek curves and futuristic designs that can stop anyone in their tracks. However, it does sometime goes wrong and some truly ghastly cars do hit the road. When this happens, both buyers and even the manufacturer turns their back at the showroom. Whether it’s from an outrageous design or just a combination of errors, it’s not easy to forget such monstrosities. However, which models are the ones that truly hit the headlines for the wrong reason. Fiat are known for making cars that many people think look cute or adorable. Unfortunately, the Multipla is kind of the opposite of this. The large minivan is based on a predecessor that had some success back in the 1950s but unfortunately it didn’t capture the same feeling. The biggest flaw is up front with a small rim underneath the windscreen ruining the front. The back isn’t much better where it’s just a giant rectangle with the same sickening bump bulging under the rear screen. This monstrosity was made for over a decade before the Italians woke up and stopped production of the model in 2010. Aston Martin produces some of the most beautiful cars in the world. They represent luxury and elegance. Well 99% of the time. Back in the 1970’s, the British manufacturer made the Lagonda which was a major blip on the radar. 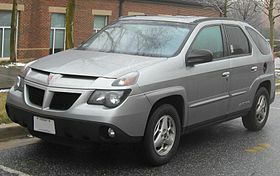 Despite featuring many ground-breaking mechanical aspects such as computer electronics, the design department went on holiday and wrecked the car. It has a hideously long nose which would give Pinocchio a run for his money. On top of that, the pop up headlights looked clunky and out of place on the Lagonda. Still, it’s an Aston Martin and we’d still buy one even if it was in a back alley! It’s one of the best known cars in the world but the DeLorean is far from legendary. It might have been able to travel back in time but that is the only good thing about the DMC-12. Hardly looking like the usual Hollywood star, the DMC obviously hung out with Frankenstein as it look likes all the square panels were just molded together from the scrapyard. As big as it was wide, the DeLorean really was an eyesore not to be missed. It didn’t sing well either with its 2.8 V6 engine always struggling to power such a wide and heavy car to it’s maximum. It really was a waste of great potential and DeLorean will always want to go back to the future and fix their wrong-doings. It’s hardly a household name but the Isseta optimized everything that was wrong with the bubble car. Looking like it was crushed in all directions; the Isseta hardly takes any true shape – not even a circular dome to live up to its reputation. It only got worse as major manufacturers got involved. BMW invested heavily into Isseta which made even scarier cars such as the BMW Isseta 600 that looked like it was dragged off the torture rack. It was hardly practical either with 2 people getting squashed inside making the car and its owner a laughing stock. Unsurprisingly, the model has now grown a cult following and now replica kits can let people re-live one of the strangest cars ever made. I love this new “Immigrants” ad for the Fiat 500 heralding “the next wave of Italians” coming to America, particularly since my own parents came from Italy. 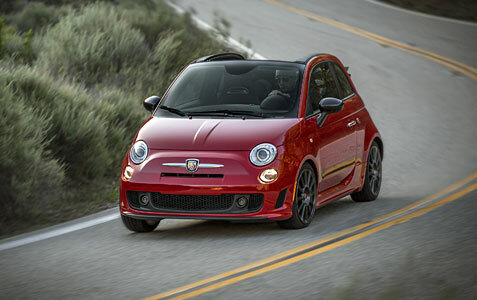 We just caught the new JLo commercial for the Fiat 500, and we have to say we like what we see from her and the car! Coming off her breakup with Marc Anthony, Jennifer Lopez looks spectacular in this video. Also, as you can tell from our recent review, we like the new Fiat 500 as well.